Having got the whole Christmas thing out of the way the countdown is on to our ‘trip of a lifetime’. Had I know how much the trip was going to end up costing I don’t think I could have justified it. As a result I’m very glad I didn’t know, and that I have not felt the urge to add it all up. People tend to ask the same questions when they hear about the trip. Do you sail from Tasmania? Actually the trip is to the Antarctic Peninsula which is much closer to the tip or Argentina that any part of Australia is to Antarctica’s east coast. The Ushuaia has 84 passenger berths, and our photographic group numbers about 20 people so we will be well represented. From what I’ve read we’re expecting most days to be between -5 °C and 5 °C. I’ll let you know if that was wrong when I get back. South Shetland Islands and the western side of Antarctic Peninsula, Livingston Island, Half Moon Island, Deception Island (volcanic crater), Paradise Bay and Lemaire Channel (gigantic icebergs and huge cliffs). Will you see polar bears? Ah no, they only live in the Arctic with Santa. I wonder if that’s where the Claus (claws) part comes from… And before you ask, no, you won’t see penguins in the Arctic. Bears north, penguins south. Tigers in Asia, Lions in Africa. Dolphins aren’t fish. You get the drift. Have you got warm clothes to take? It’s all about layers. It is difficult to know if we have enough or even too much stuff. We’ve been given advice by the kind folk from World Expeditions so hopefully we are on the right track. Even so, just how many pairs of socks do we need? In the age of digital photography you can afford to have a number of misses to each hit. When I head out, camera in hand, I know that when I come home I’ll have anywhere between a few hundred and upwards of a thousand images to review. Shooting in RAW has lots of advantages, but the files are big and the process of going through each one to decide if it is a discard or a keeper can be a slow. To ease the pain I use a piece of software called FastPictureViewer Pro. I’ve been happily using it for over two years now so I’m comfortable enough to share my experience with it. To my great relief the Pro license I bought will allow me to install it on my laptop as well as the PC, so when I’m traveling to far off parts next year I won’t be without this nifty bit of kit. The license, including codecs, cost me $50 when the AUD / US exchange rate was just about at parity. I haven’t had to pay a cent for upgrades since, but apparently if/when there is a major upgrade I’ll get a discount. It’s available to trial for free. So, what does it do? The codecs allow you to browse thumbnails of raw images through Windows explorer as you would jpgs. 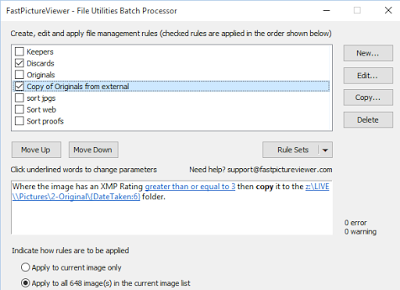 The viewer lets you review all of your images super fast, quickly rate or tag them, and apply workflow to delete, copy, rename, resize based on those tags and ratings, and a stack of other rules. Plug camera into the PC and let the EOS utility download all of the images into a date named folder on my external hard disk (Called Photos – original). I have a card reader, but I really like the way the EOS utility works and prefer to copy direct when I can. 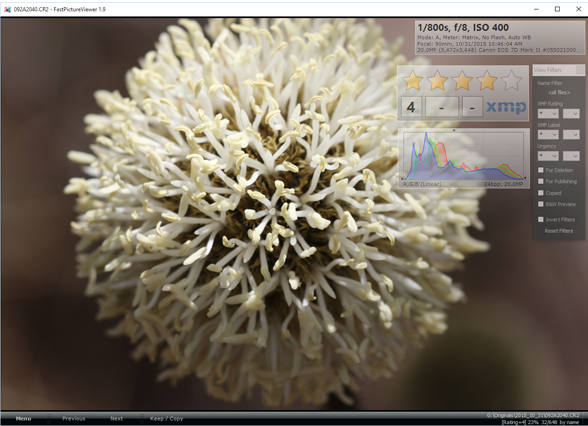 Reviews images one at a time, zooming in with a click of the mouse to see which images have what you’re looking for in the finer detail. 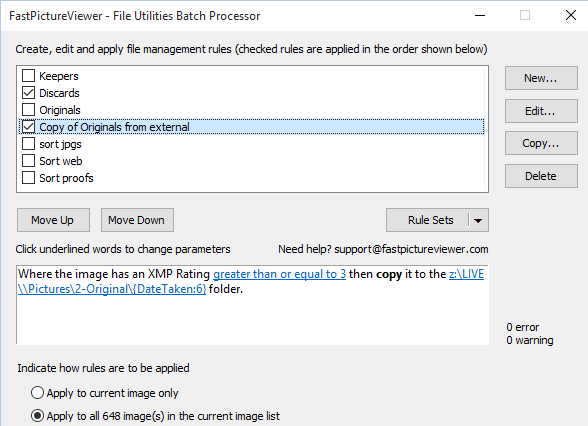 Use the one key rating method to assign a xmp rating to each picture. original disk but don’t copy it anywhere. You can flag pictures for deletion, or for publishing and it can publish straight to Zenfolio, Facebook, Flickr etc. I prefer to do some work on my keeper images before they go anywhere else. The interface includes some great features, which come in handy when you are trig to see at a glance why something worked, and something else didn’t. So aperture, shutter speed, ISO, metering mode etc are all front and centre as well as a histogram. You can toggle those displays on and off as you wish. They can also sit on your second display as they aren’t locked into the Viewer window. I’m sure that by now there are other applications out there that do similar things, but I think it speaks well for this product that in two and a half years I have never once gone looking for an alternative. It does the job I need it to, and does it well and you can’t say better than that.